Through our printing.com facility, we can now offer you a new low cost way of ordering corporate business cards. The system saves you time and money and lets you take control of your own business card artwork. We create an online ‘Template’ from your existing business card artwork for you to edit. Editing the ‘Template’ is easy, with you being able to personalise the editable details as required. 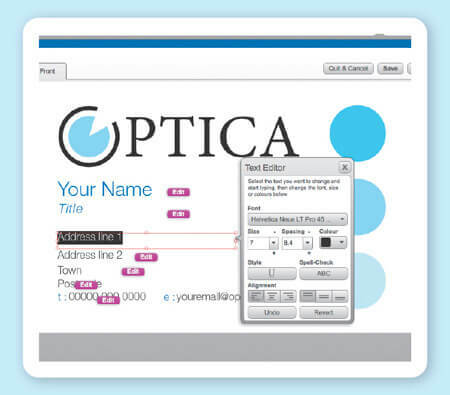 Within the editable areas, font sizes and colours can be fixed or flexible to meet your requirements. Certain elements of the artwork can be locked, for example your company logo, and therefore protected from unwanted adjustments. The set up is £49 plus VAT and includes the building of the business cards template from your existing artwork plus training on how to use the system. Once set up, you will no longer have to pay job by job artwork costs therefore saving you money. You will be in control of any amends or new business card names that may be required in the future. …So it’s win, win all the way! We are happy to come out to demonstrate how the system works so why not give Clare a call on 01543 261220!